Today only a quick peak at what I’m doing because things have grown a little but nothing new here yet: The sweater is now ready to be divided for the sleeves and I even knit ten rows of the first cuff too. The Stockholm cowl is four times its size of last week but far from finished and there wasn’t even a hat last week. After not finding a pattern we both liked I made something up. 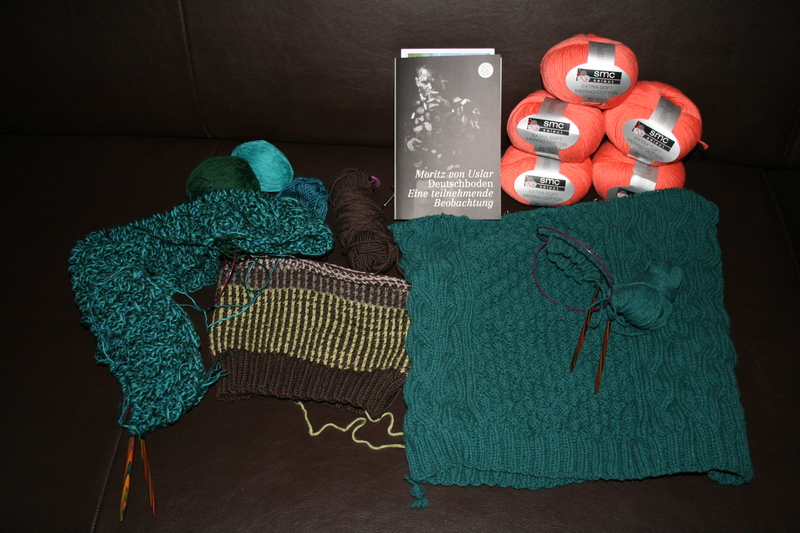 It is using up the left over yarn snippets I had from Michael’s boneyard shawl in green, beige and medium brown and should go well with the shawl. I’m ready to do the decreases now and think it will be a very cool hat. And then I went yarn shopping again. I know three project in work plus I think four hibernating projects should be enough, but I’ll finish at least one at the weekend so I thought I follow Ginny and add a bit of mystery to my life as well and join the Follow your arrow Mystery KAL. Lets see what I’ll get out of it. I’m a bit worried the finished object will not be to my liking but then this lovely salmon coloured Merino yarn was a real bargain, only 1,50€ per skein plus the pattern this means that I’ll only have spend 12€ on the project and had fun knitting it. As for reading I started another Christmas gift book: Deutschboden by Moritz von Uslar. It is a book about a reporter going to Eastern Germany to live in a little town for some month to experience what life is like there. Very interesting and super funny so far. Joining Ginny’s yarn along as usual. What about you? This entry was posted in Knitting & Crocheting and tagged Cowl, Hat, Knitting, Sweater, Yarn Along by kathatravelling. Bookmark the permalink.